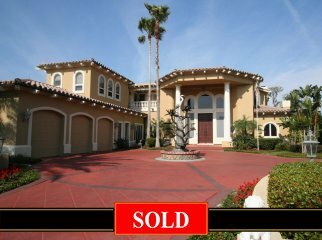 The Residence: This impressive Mediterranean lakefront estate home is located in Bay Pointe, a prestigious, lakefront, gated community, and exemplifies the beauty of authentic Mediterranean design on the exterior and palatial European finishes on the interior. 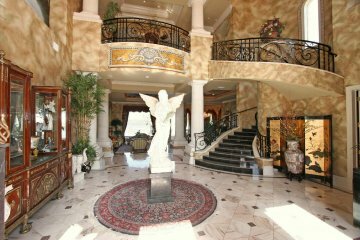 One enters through 12’ cathedral double doors into a dramatic 22’ wide marble Foyer under a rotunda ceiling with an elegant winding granite staircase banded in elaborate iron and ascending to open balconies above. Appropriately named Ventana del Lago (window of the lake), upon entering, one captures an immediate vista of the lake through the glass walls of the 32’ wide Grand Salon. 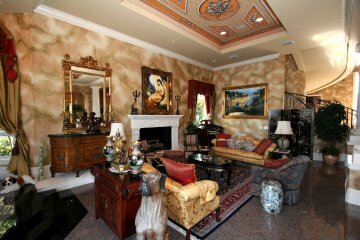 Marble and granite flooring, deep moldings, elaborately detailed hand-painted ceilings, dramatic ceiling-to-floor cathedral windows elegantly dressed in imported silks and fringes - all contribute to the palatial interior setting and the ambiance of one of Central Florida’s most beautiful residences. The glass walls and balconies, which span the entire rear of the home, allow the waterscapes to become an everyday part of your living environment. It is surprising to know that although the interior offers a very palatial setting, suitable for large gatherings and formal corporate entertaining, it is also a very comfortable family home with many areas suitable for adults as well as children. 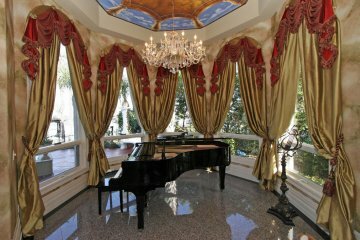 The 33’ Grand Salon, offering a raised pavilion for seating or for a grand piano, and a banquet size Dining Room, crafted of marble, granite and hand-stenciled walls overlook the lake with French doors leading to a poolside, lakefront terrace. 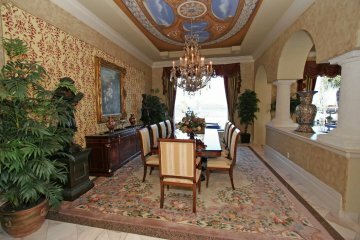 A handsome mahogany paneled Library, with custom cabinets, is located off the Foyer. 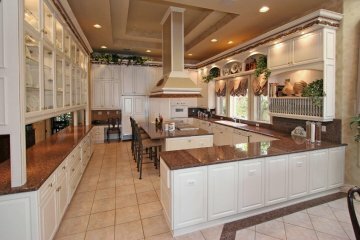 The Kitchen is equipped with an abundance of cabinet storage and cooking areas topped with “miles” of granite, and adjoins a large Butler’s Pantry with additional appliances and cabinets – designed for catering services. 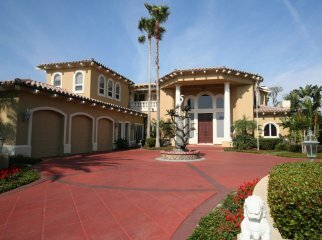 The residence has a rear and front staircase. There are five (5) bedrooms en suite in the residence, one of which is located on the first floor. An elaborate Home Theater, with tiered seating, adds to the entertainment features of the home. 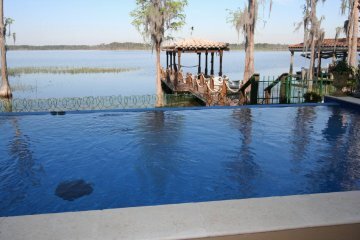 The 37’ long heated pool has an infinity edge and which gives the appearance of water running over the edge into the lake. There is also a heated Spa, a Boat House and dock – and best of all an outdoor covered Kitchen and Dining Area complete with wet bar, refrigerator and grilling area. 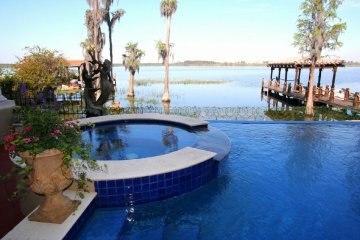 Enjoy a Florida lifestyle in this magnificent, yet comfortable, private resort setting! All furnishings available! Just move in! $4,250,000.